Health Lottery offers an interesting philanthropic proposition, but ultimately fails due to numerous limitations. It’s not every day that you get to play lottery while giving something back to society. The lottery isn’t exactly associated with charity, after all. And yet, that’s what Health Lottery does. They offer one, affordable game, for which a portion of the funds go to health-related causes. It’s interesting and noble, but it isn’t for lottery lovers. Beyond the very limited lottery selection, the biggest possible jackpot you can win here is capped at £100,000. You can win prizes below that, but never beyond it. Meanwhile, players have to manually set up a syndicate if they want to play in groups – which means you can’t just join one immediately on their site. Still interested? Only residents of Great Britain are allowed here. That said, whether you are a resident or not, I would advise you to look elsewhere. If you were hoping to play in some of the biggest and most lucrative lotteries around – like US Powerball or Mega Millions – then you’re going to be sorely disappointed. Health Lottery only has its one lottery game on offer, which costs £1 per entry and offers a jackpot prize of up to £100,000. Another important thing to note is that for every £1 spent on their site, 20 pence goes to local health-related causes. Surprisingly, Health Lottery offers a group play option for its lottery game. First, you need to download an agreement form. Then, you need to pick your team. It can be anyone – be it family, friends, or colleagues. Your choice. Pick your numbers and decide on how many draws. Have everyone in your team, including yourself, sign the agreement form. You can also get a syndicate pack if you want more help in getting started. On top of all the need-to-know information about their syndicate play, the pack also contains a poster to aid you in recruiting members to your syndicate, some playcards, and – amusingly – a fridge magnet. A small sampling of their Instant Win games. Beyond their singular lottery game, Health Lottery also provides interactive, instant win games. These are small video games that you can play to win some real money. Each game has a different theme, a different goal, and different cash prizes. Each entry costs £1, and the highest prize you can win is £10,000 – though most games offer less maximum prize thresholds. It’s not immediately clear what banking methods Health Lottery accepts. From rummaging through their website, what’s apparent is that they accept bank transfers and debit cards. But, exactly what banks or debit cards (or even credit, if any) are accepted aren’t really discussed. Perhaps registered members can see the options available, but since I don’t have a Great Britain address nor a Great Britain bank account, it’s difficult for me to confirm that. In any case, information like this should be displayed upfront so interested players can immediately see if the payment method they use regularly is accepted or not. Health Lottery may have tons of limitations, but they are at least a safe and legitimate lottery site. For starters, they employ Starfield Class 2 SSL to ensure that data going to and from their site are encrypted. Beyond that, they are also licensed and regulated by the UK’s Gambling Commission. This alone tells you that they abide by the strictest of gaming standards, so you don’t have to worry about it being a scam. Health Lottery’s FAQ is pretty meaty, though their contact options are a bit limited. For the most part, their FAQ manages to go through nearly all aspects of their service in detail (save from their accepted payment methods). However, if you run into a problem that self-help measures cannot solve, you can only get in touch with Health Lottery via phone or email. There’s no live chat option and their agents are only available during regular UK business hours. Health Lottery manages to provide adequate education about its lottery game. You can find a lot of information about their game, their raffles, and other aspects of their service peppered throughout their entire website. Honestly, I would be surprised if they botched this up, seeing as how they only have one lottery game to educate players about. That said, there doesn’t seem to be a glossary section – though it’s not really needed here. Health Lottery’s site is pretty straight forward and easy to use. Health Lottery’s website is fun, colorful and easy to use. On top of its user-friendliness, Health Lottery’s site is clean and the aesthetic they went with is quite lively. I liked its use of different colors and images – making it seem more “fun” than other lottery sites. There’s nothing new about it though – if you’ve used a lottery site before, this should feel familiar in no time. Another thing that surprised me was that Health Lottery offers a bunch of promotions. More than that, the promotions they offer are pretty varied – and don’t feel like run-of-the-mill lottery discounts or freebies (though there are promos like that as well). For instance, they are currently running a promo that requires you to share a selfie holding your Health Lottery ticket for the chance to win a brand new iPad Pro. They also run special raffles wherein lucky online players can win cash prizes, vouchers, gadgets and more. Creating a free Health Lottery account requires a bit more information from your end, but it is still quite easy. 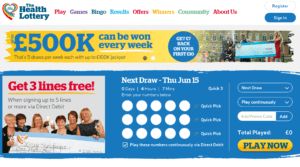 Click on the “Register” button located at the top right corner of Health Lottery’s website. Fill up the registration form. Provide the following details: email address, password, first and last names, date of birth, postcode/address, and phone number. Confirm that you have read their Terms and Conditions. Decide whether you want to receive exclusive promotions and offers via email. Pretty easy, right? 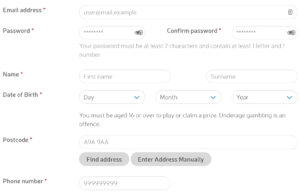 There’s a caveat though: If you aren’t a resident of Great Britain (or England, Scotland or Wales), the website will know and prevent you from ever reaching the sign-up page. I actually had to use a VPN just to be able to get a look at their registration process. Since Health Lottery only has one lotto game on tap, you don’t have to keep up with various game rules. It’s easy, too. Log in to your Health Lottery account. Click on the “Play” link on the navigation menu. Decide how many lines you want to play. For each line, choose five numbers from a pool of 1 to 50. You can also have your numbers automatically chosen for you via the Quick Pick option. Decide whether you which draws you want to participate in. Decide if you want to play continuously. You can choose to do so up to 8 weeks. Add a promo code if you have one. Click on the orange “Play Now” button. Winning and claiming prizes works just like any other lottery site – though there are some variances when it comes to the latter. During drawing, 5 numbers plus a bonus ball will be drawn. Results will be broadcasted very Tuesday to Saturday. Much like most lotteries, your prize depends on how many balls match the numbers you have chosen. 5 balls, for instance, will net you the jackpot. The fewer balls you match, the smaller the prizes become. Online Players & Direct Debit Players: If you win less than £2,000, Health Lottery will transfer your prize into your account. But, if you win £2,000 or more, you will have to call them so their team can guide on what to do next. Retail Players: If you purchased your tickets from one of Health Lottery’s retailers, you can claim winnings of up to £50 from them. However, for prizes up to £250, you would have to claim your prizes from a participating Post Office. Finally, if you’ve won more than £250, you need to call Health Lottery so they can assist you and provide further guidance. You get to choose from a ton of lottery games from all over the world. 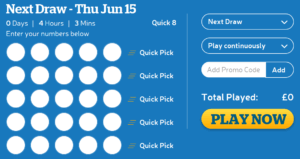 theLotter gives players access to over 53 lottery games. Plus, you can also easily participate in 24 syndicates – as well as the occasional millionaire raffle. The accepted payment methods are clearly laid out. theLotter accepts over 29 payment methods, and they provide in-depth information for each one. They’re open to players from different countries. Players from all over the world can play here – except for those who live in areas where online gambling is illegal. You can play in many games other than solo play lotteries. WinTrillions offers 20 lottery games for you to choose from. In addition, they also offer various syndicates, millionaire raffles and even raffle syndicates. You can purchase tickets using any of the various accepted payment methods. Transactions are made easy as WinTrillions accepts 32 different payment methods. It’s easy to join syndicates. No need to manually set-up a syndicate yourself – you can join one in a few clicks! Players from all over are welcome here. With the exception of a few countries where online gambling is illegal, LottoKings accepts players from many different countries. Some of the biggest and most lucrative lotteries can be found here. From US Powerball to Mega Millions and more, you can find the biggest and the best lotteries at LottoKings. They can claim prizes on your behalf. You can choose to permit LottoKings to claim your winnings on your behalf. Should you do so, you can then collect it from them – either via check or their office nearest you. The Bottom Line – Should You Use Health Lottery? If you live in the UK, it’s worth a look. Otherwise, you really don’t have a choice but to go elsewhere. Health Lottery has a few things going for it, but it’s far too limiting a lottery site to be an instant recommend. Sure, if you fit their strict player requirements, it’s not a bad idea to give it a look – especially since every purchase helps fuel a good cause. Plus, they also offer some really interesting promotions. However, you only get to play in one lottery game and the maximum jackpot isn’t even that impressive compared to other lotteries. Meanwhile, setting up a syndicate feels like a chore compared to the more systematic approach of other sites. Whether you are a lottery fanatic or just a casual player, there are far better sites out there. Contrary to what some may perceive, Health Lottery is not a national lottery. 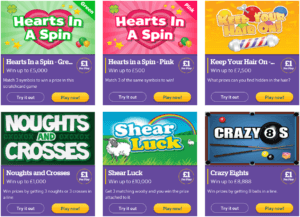 It is made up of a group of local UK lottery societies – each one licensed by the Gambling Commission – that have come together to support health-related causes. They take turns participating in the draws so that every area they represent gets a fair share of the proceeds.